Clarion Housing has secured planning approval for 37 new affordable homes in Fishbourne Road, Chichester. The scheme – which has been designed by leading design practice Conran and Partners – brings forward an empty brownfield site close to Fishbourne Roman Palace to provide much needed new and affordable homes for Chichester. Located on Fishbourne Road (East), the former office buildings on site have stood vacant since 2012. The proposals seek to revitalise the western end of Fishbourne Road (East) and introduce new homes into this existing residential area together with a large public open space. The designs incorporate a varied mix of homes, from apartments through to large family houses for Affordable Rent and Shared Ownership, providing an opportunity for local people to get on the property ladder. The design has been carefully developed over a number of years by working closely with Chichester District Council and other key stakeholders to ensure that the proposals sensitively respond to the surrounding context. Ranging from 2 to 3 storeys in height, the design offers a contemporary twist on traditional forms, drawing on materials from the local area such as tile, slate and brickwork with texture and variance. Elegant, generously proportioned windows are proposed to allow lots of natural light into the new homes whilst enabling overlooking and monitoring to the new shared surface street and public open space. Over 600m2 of public open space has been incorporated into the design as part of a highly attractive and robust landscape solution. Clarion expects to start on site in autumn 2019 for completion in 2021. Liz Hills, Head of Development (New Projects), Clarion Housing says: “At Clarion we are driven by a desire to play a major part in addressing the country’s housing shortage. Over ten years we will invest £13bn in our development programme and plan to build 50,000 homes. Lee Davies, Partner at Conran and Partners, adds: “We are delighted by the Council’s decision to approve this scheme which will provide the city with much-needed new housing. 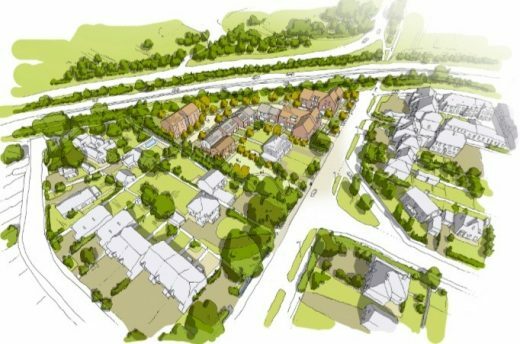 Our design approach, developed from a close consultation process, seeks to encourage a vibrant residential community in this part of Chichester. Conran and Partners has won an open competition to transform a historic Lambeth site into much-needed new homes in London. The architecture and design practice has been awarded the contract to develop more than three acres of prime inner London land by Henley Homes, one of the capital’s leading housing groups. Conran’s design team will be tasked with creating approximately 180 to 220 homes on the site of the former Lilian Baylis School in Lollard Street, using a mix of refurbishment, conversion and new build. Bluebird Gastrodrome – Restaurant, Bar & Cafe / Sainsbury’s Supermarket. Former garage for the Bluebird Motor Company, reputedly the largest in Europe at the time. Office of Conran & Partners is led by Sir Terence Conran and was formerly called CDP – Conran Design Partnership. Architects studio based in Bermondsey, southeast London near Tower Bridge. Sir Terence Orby Conran is a celebrated English designer, most famously associated withn the Habitat store, but latterly known also for a string of high-end restaurants in the capital. Conran and Partners is a collaborative design studio working across master planning, architecture and interior design, with projects throughout the UK and around the world. With studios in the UK and Hong Kong, the Conran and Partners’ team is skilled in designing high quality proposals which demonstrate sensitive consideration for context and local planning constraints, particularly for community-driven mixed-use sites. The studio believes in working with local communities at the very early stages of a design to create neighbourhoods with integrity and longevity. Conran and Partners’ other mixed-use schemes include Butler’s Wharf, Wornington Green/Portobello Square and Stadium Place, Walthamstow (all in London), and Anston House (Brighton and Hove). The practice’s continued transformation of a failing housing estate in Ealing (Green Man Lane) to deliver over 770 new homes, community facilities and a new school, has become a flagship project for the Police’s Secured by Design initiative, creating safer neighbourhoods through design innovation. The practice’s design skills have been endorsed by over 50 design awards and commendations, including Civic Trust Awards and RIBA Awards for work in sensitive contexts. January 7, 2019 in Architects.